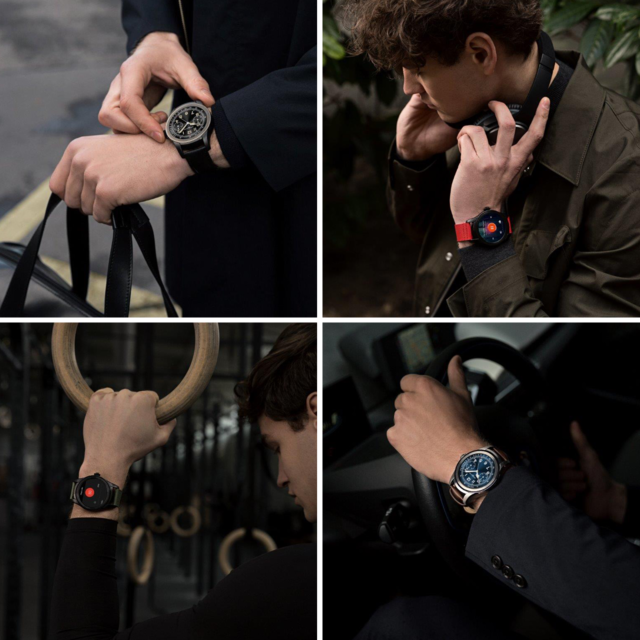 Just days after TAG Heuer launched its ambitious second-generation smartwatch, which we told you about here: TAG Heuer-Connects with Modular Options, Montblanc debuts its own digital wristwear: the Montblanc Summit, the brand’s first full-fledged smartwatch. The Summit provides far more than Montblanc’s previous nod to digital wearables, the E-Strap, a Bluetooth bracelet attachment paired with Montblanc Timewalker watches offering activity tracking and notifications. The E-Strap, which debuted in early 2015, was clearly only the first step in Montblanc’s digital trek, which this week reaches new heights with Summit. The new Montblanc Summit is a 46m smartwatch primarily housed within Montblanc’s 1858 case design around a bright screen/face inspired by the same collection. While wearers can substitute many faces, including that of the Montblanc TimeWalker Urban Speed, the watch’s case echoes the 1858 collection’s case and crown combination. And notably, the case is topped with a curved sapphire crystal, like 1858, which Montblanc says is a first among smartwatches. 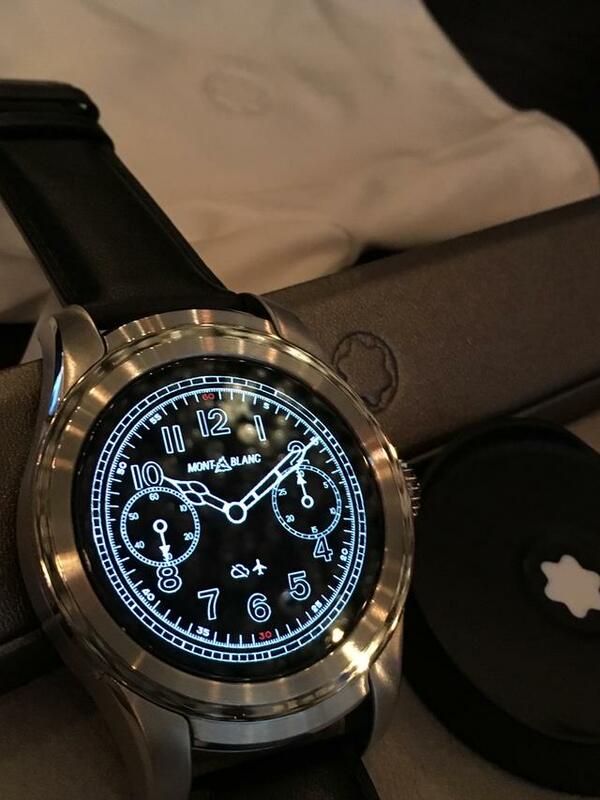 Under the Montblanc dial users will find Android Wear 2.0 and Google’s latest operating system for smartwatches offering a host of novel timekeeping, fitness, notification, music and communication functions. True to its name, The Summit specializes in providing a series of fitness metrics, including a heart-rate measurement and four daily goals (steps, calories burnt, distance, active time) with a progress bar visualized in the shape of a mountain’s summit. A particularly sophisticated worldtimer micro-app with day & night visualization shows the time in any one of the world’s 24 time zones. In addition the touch-screen display and microphone offers access to a gyroscope and a compass, a barometer that can indicate the altitude, and an ambient light sensor. The watch is compatible with both iOS and Android smartphones. Among the many customizable displays, one my favorites is the ability to utilize the either of the two 1858 chronograph subdials to display functions not found on the original. For instance, at the swipe of the screen the wearer can place the seconds indication in either of the two chronograph subdials. The Montblanc Summit’s 46mm case comes in a choice of four different materials and styles: black PVD-coated steel, a bi-color steel case with a black PVD-coated steel bezel, a steel case with satin finish or a satin-finished titanium case. Each timepiece is fitted with a pusher in the design of the iconic crown from the 1858 collection. The watch faces are precise digital representations of the 1858 collection, including the Automatic model with date, the Small Second or the Chronograph. The Small Second and Chronograph can be combined with digital complications such as a world time, meeting or fitness goals. 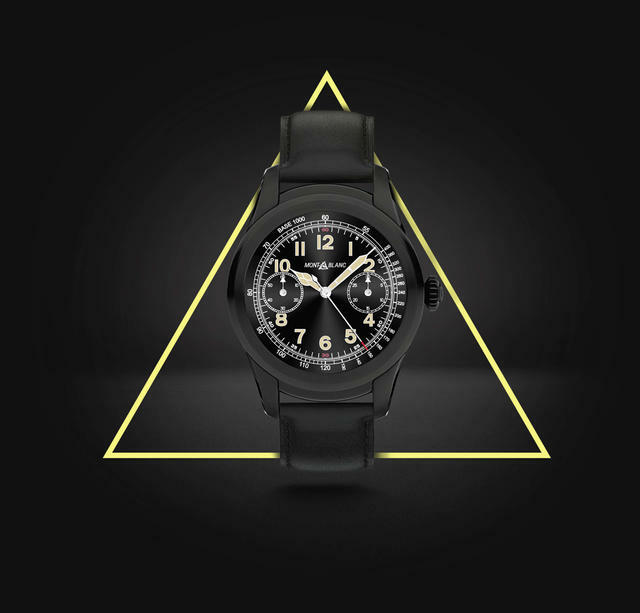 Using the sportier TimeWalker Urban Speed face (not pictured here), wearers can substitute an Automatic Date or Chronograph. This face, unlike the more classic 1858 design, allows the wearer to choose from several color options. In all, the Montblanc Summit can be configured from among more than 300 different style and color combinations. 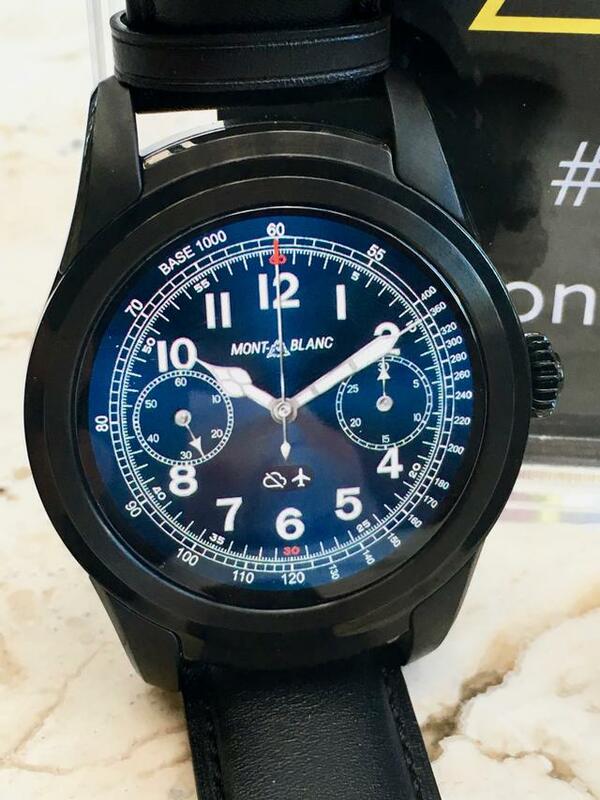 Montblanc notes that it plans to regularly update watch faces, which wearers can download from the Summit’s Google Play Store. Montblanc also offers a set of eight strap options for the Summit, including an alligator strap, a rubber NATO strap (in black, blue, green or red), a black calfskin leather strap (in brown or navy blue) and a Sfumato calfskin leather strap from the Montblanc Pelletteria in Florence. Straps can be easily exchanged via the quick-release spring bars. The watch can be charged via micro USB on a magnetic Montblanc dock. It connects via Wi-Fi and Bluetooth and features 4GB of flash storage that can be used to sync and play music without the need of a smartphone. Starting in May the Montblanc Summit will be sold for two months via online retailer Mr. Porter. After two weeks the new smart watches will be widely available on the Montblanc website and through all Montblanc retail channels. 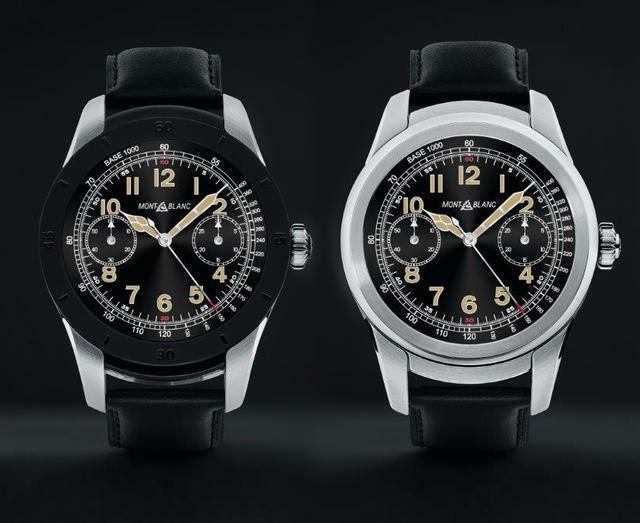 For more information visit www.montblanc.com. Prices start at $890 and rise to about $1,100, depending on the choice of case style. 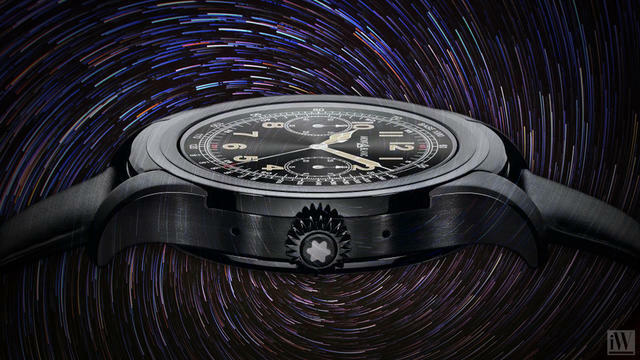 A customized dial can be created with Montblanc for much more (approximately $15,000).